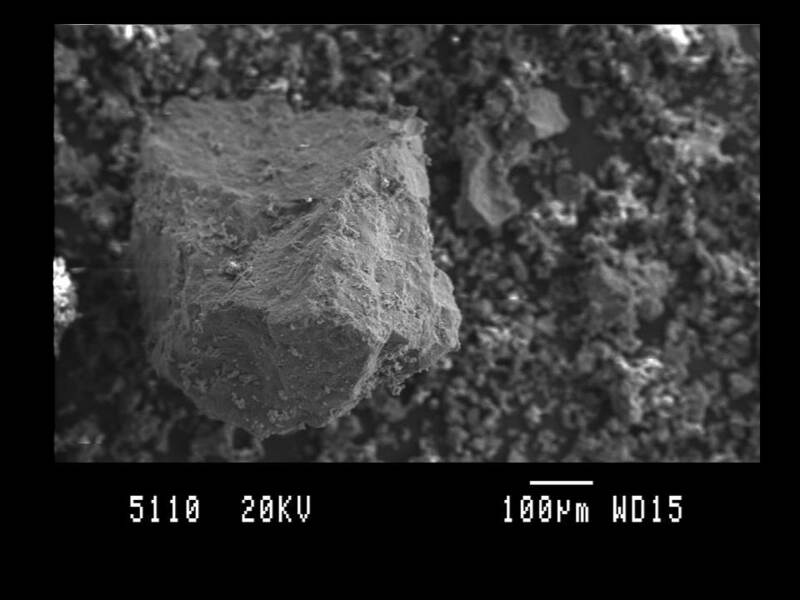 Scanning electron microscope image of some volcanic ash grains from the Eyjafjallajökull eruption, April 2010. The scale bar is 100 microns (μm), or 0.1 mm long. Notice that the ash grain is ‘blocky’ with no sign of any gas bubbles – a pretty good indication that the erupting magma was shattered into a fine ash by contact with water or ice. Image credit: David Pyle. Eyjafjallajökull is an ice-covered volcano in southern Iceland. It was a volcano very few people had heard of before it erupted in April 2010, scattering fine ash across northern Europe and bringing air travel to a grinding halt. The volcano itself is actually called Eyjafjöll, but this is not quite such a tongue-twister for non-native speakers of Icelandic. Eyjafjallajökull is a stratovolcano in Iceland’s eastern rift zone, with a summit crater that is about 2.5 km across. The volcano is somewhat overshadowed by its much larger and more active neighbour, Katla. How does Eyjafjallajökull stack up as a Top Trumps Volcano? Eyjafjallajökull is not a very active, or very well known volcano. It last erupted in 1821 – 1823, and may have erupted four or five times in the past 2000 years. Last known eruption: March 2010 – June 2010. The eruption began with a small fire-fountaining eruption, from a fissure called Fimmvörðuháls about 5 kilometres east of the summit. The main explosive part of the eruption began, rather unexpectedly, in the summit on April 14th, and continued on and off for a few weeks. Explosivity (Volcanic Explosivity Index) – 3. The 2010 eruption was moderately explosive, particularly for a period of time in mid-April when hot magma began to come into contact with ice and melt-water in the summit crater. This led to the dramatic episodes of ash-rich eruption that caused such disruption when the low-lying ash cloud drifted across northern Europe. Height – 1666 m. Eyjafjallajökull is just a little taller than neighbouring Katla (1512 m). Deadliness. 0. There were no reported deaths that were attributed directly to the last eruption. Wow factor – 26. While the 2010 eruption was dramatic, the volcano itself is less so. Unpredictability – 18. All of the historical eruptions of Eyjafjallajökull seem to have been relatively small, so the unpredictability score is low. Devastation Potential – 44. The volcano is rather less of a threat than its larger neighbour, Katla. Fun Fact – One of the few geologists who had actually worked on Eyjafjallajökull before the 2010 eruption was Dr Sue Loughlin, who carried out the research for her doctorate on the volcano in the 1990’s. At the time of the 2010 eruption, Sue was the Head of Volcanology for the British Geological Survey and was well placed to provide advice to the UK Government throughout the crisis. There is a nice set of slides about the eruption on slideshare, and some wonderful footage of the eruption on YouTube; this clip from Frederik Holm.